Black Seed Oil Is Scientifically Proven To "Cure" Any Health Problems! These black seeds are native to Southwest Asia and are known by various names such as: nigella, kalonji, black cumin, black caraway, black sesame, onion seed, roman coriander. You may or may not have heard of black seeds, but there are over 1,000 scientific peer-reviewed articles published about its benefits. There are almost no health issues that these seeds cannot benefit, and what’s more remarkable is that there are no side effects from ingesting it. The researches are promising on the use of black seed oil for dealing with various diseases, and has been found to be resistant even against various recently discovered “superbugs” including HIV and cancer. NO synthetic pharmaceuticals can, nor will ever be able, to duplicate what black cumin seeds are capable of. Other active compounds are crystalline nigellone, myristic acid, palmitic acid, palmitoleic acid, oleic acid, linoleic acid, stearic acid, arachidonic acid, various B vitamins, full range of proteins, and many important minerals. 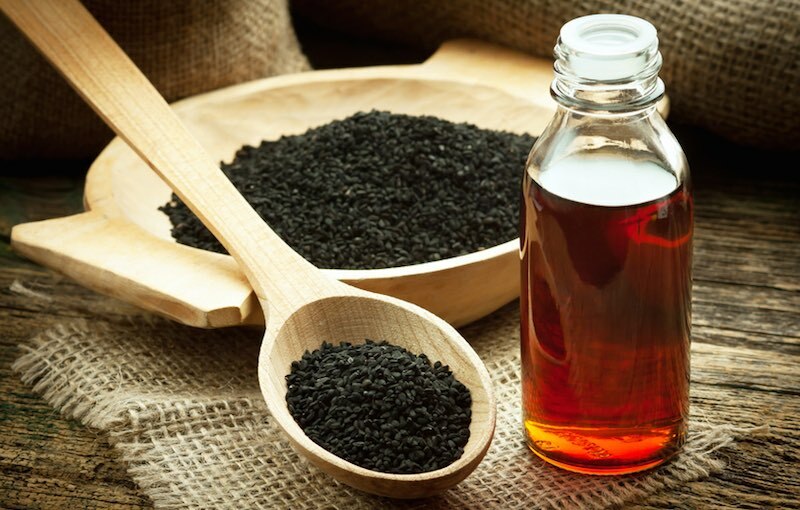 There are so many health benefits and uses of black seed oil as listed below, as this oil has been widely studied due to its fascinating healing abilities, next only to oregano oil. Anti-Cancer: Scientists fed lab mice with black seed oil and was able to decrease tumor cells by up to 52%! Studies show that treatments using large doses of black seed oil is able to suppress and retard cancer cells in patients of cancers such as the bones, liver, lymphoma, pancreatic, osteosarcoma, bladder, breast, colon, skin and lung. Anti-Fungal: Research shows that black seed oil has active antifungal and antibacterial properties that effectively eradicate harmful pathogens. It works by strengthening your white blood cells (your defence system) in fighting off infections. Anti-Viral: A recent study has proven that black seed oil is effective in the treatment of HIV (human immunodeficiency virus). Treatments in adult HIV patients for a period of six months were successful for complete recovery with no recurrence of symptoms. This may also be good news for eradicating similar sexually transmitted viruses such as the HPV (human papillomavirus), gonorrhea and chlamydia. Allergies: The potent antibacterial and anti-inflammatory compounds in black seed oil work fast when used for treating allergies and sinusities that result from a weak immune system. Anti-Parasitic: Black seeds possess clinically useful anti-parasitic activity, comparable to triple eradication therapy. Use in conjunction with this parasite cleanse protocol to eradicate parasites such as Helicobacter Pylori, Blastocystis Hominis and Giardiasis lamblia. Brain Health: When gut health (see digestive health) is strengthened, brain performance is usually improved. One can expect better memory recall, cognition and increased mental power and concentration. Using the oil therapeutically has also shown to be beneficial for preventing dementia, Alzheimer’s and Parkinson’s diseases. Diabetes Type 2: Taking black seed oil daily will help reduce fasting glucose, decrease insulin resistance, increase beta-cell function, and reduce glycosylated hemoglobin (HbA1c) in human subjects. Definitely a much safer option than metformin that causes a long list of side effects and a dependence on the drug. Digestive Health: As our immune system is dependent on the health of the microbiome ecology in the gut, black seed oil is highly effective in repopulating the flora with beneficial bacteria for strengthening of the gut health, thus the immune system. In the process, it improves digestion, heals ulcers, refluxes, digestive issues (IBS), stops gas and bloating. Epilepsy: Black seeds were traditionally known to have anti-convulsive properties. A 2007 study with epileptic children, whose condition was refractory to conventional drug treatment, found that a water extract significantly reduced seizure activity. Gynaecological Health: Black seed oil is a lady’s friend. It plays an important role in regulating menstruation, eliminating foul-smelling discharge, prevents pre-menstruation symptoms and strengthening uterus health. High Blood Pressure: Studies show that ingesting black seed oil help to lower high blood pressure. It is also known to improve cardiovascular health. Joint Health: Ingesting black seed oil helps to reduce inflammation of joints as in the cases of arthritis (both osteoarthritis and rheumatic arthritis). Applying the super oil directly on the joints will also provide an almost immediate relief. Liver Health: Some of the side effects of medication are damaged liver and liver diseases. Use of black seed oil has been shown to detoxify the liver, heal, repair and improve the functions of the liver. Mood-Lifting: Studies have shown that black seed oil is effective for stabilizing moods, reducing anxiety, stress and depression, eliminating the need for harmful antidepressant drugs. MRSA: Black seed has anti-bacterial activity against clinical isolates of Methicillin Tesistant Staphylococcus Aureus. Scientists discovered that this strain of superbug was sensitive to Nigella sativa, enabling treatment with this oil to slow down or stop the bug from spreading. Muscle Cramps and Spasms, Prevent: Black seed oil may be ingested or topically applied on muscles to prevent and ease muscle cramps or spasms. Renal Health: Black seed oil is beneficial for preventing stone-formation in kidneys, and protecting kidneys from damage by high blood sugar as in the case of diabetes. The antimicrobial activities in black seed oil are also effective for fighting against or preventing bladder and urinary tract infections. Respiratory Health: Ingesting black seed oil helps your respiratory health by opening up airways and improving lung health. The anti-inflammatory properties of black seed oil make it beneficial for use against asthma, bronchitis, chest congestion and emphysema. Skin Health: Black seed oil can be ingested or applied topically for relief of skin problems such as acne, burns, eczema, fungal infections, insect bites, shingles, psoriasis, ringworm, rosacea acne, skin breakouts. It is even beneficial for removing and healing old scars. Tonsillopharyngitis: Characterized by tonsil or pharyngeal inflammation (i.e. sore throat), mostly viral in origin, black seed capsules (in combination with Phyllanthus niruri) have been found to significantly alleviate throat pain, and reduce the need for pain-killers. Need we say more? This very powerful black seed oil is beneficial for almost any ailments, except death. 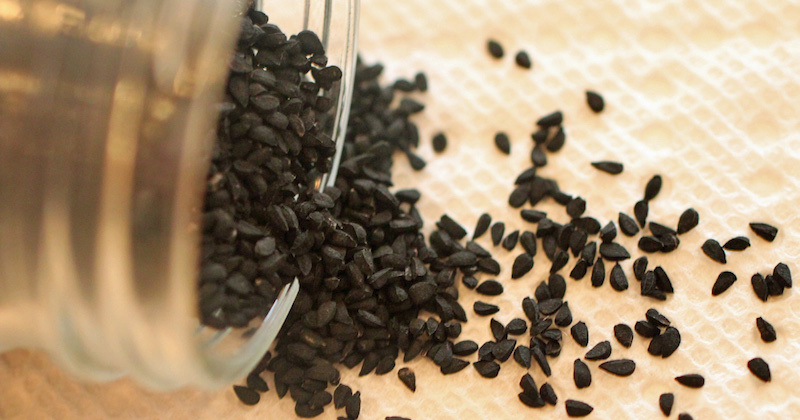 Black seeds are fast gaining its popularity for its amazing health benefits. 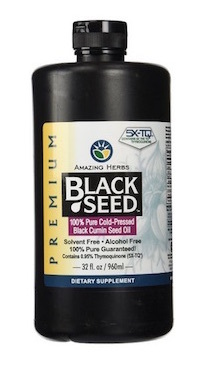 The best way to get the most out of black seeds is to consume its cold-pressed oil form. You could likely find this oil at Trader Joe’s, Whole Foods or at your local organic health food stores. They may be also be labeled as “black cumin seed oil”. In soft gel capsule form (easier to take). Or, fluid cold-pressed oil. As with all cold-pressed oil, they should best come in black bottles to keep out light and stored in cool places to prevent the oil from turning rancid prematurely. Black seed oil has incredible health benefits, but taking more doesn’t mean better. Follow the instructions on the bottle for appropriate dosage. If you are taking any prescription medications, talk to your doctor before starting to take black seed oil. Hi Sara I am on my 7th day of green juice fast for overall health and hopefully improve my psoriasis. Your site is unbelievable and fills the gap between traditional, naturopathic, eastern medicine which we all need so much. There is so much here but I am starting with the the green juice cleanse and really enjoying the journey especially when you explain what to expect. I was thinking about adding nigella seed black oil to my juices daily and beyond when I’m done and wanted to see what you thought. Hi Tamer, thank you for your kind words! A good place to start is to do a gastrointestinal cleanse: https://juicing-for-health.com/gastrointestinal-cleanse. You can complement the cleanse with your green juices. Yes, adding the black seed oil is absolutely a wonderful thing to do for your health. Happy juicing!